Yes, I want to see the dessert menu! Wishing you all a happy and safe Australia Day! I hope you are all celebrating with friends and/or family and enjoying the day. 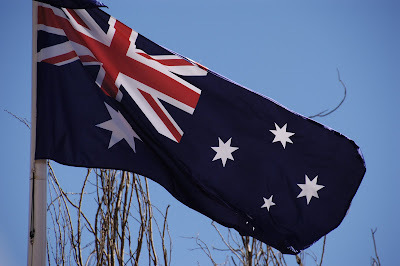 I have fond memories of an Australia Day that I spent in Leicester, England. I went to work in my Aussie flag t-shirt, and took an Aussie flag to hang on the wall behind me. I then had to explain to every customer that I served that day what it was all about! The night ended with my flatmate (also Aussie) and myself drinking a couple of VB's that he had found and sharing a packet of Twisties! It was a brilliant day! So no matter how you are celebrating today, I hope it is full of fun and laughter. 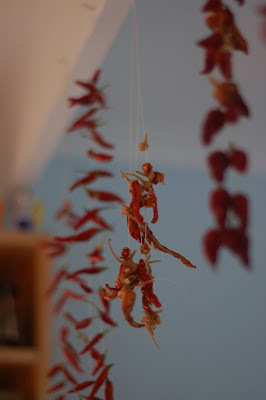 These are the chillies that hang above the bench in my parents' kitchen. Every single one of them was grown in the backyard, but as they can't eat them as quickly as they grow, they are sewn onto a string and hung in the kitchen to dry. Don't they look awesome?! "Tastes so good makes a grown man cry..."
Summer means a few things to me... hot hot weather, bugs, sunburn, jealousy that everyone else got holidays and fresh stone fruit. 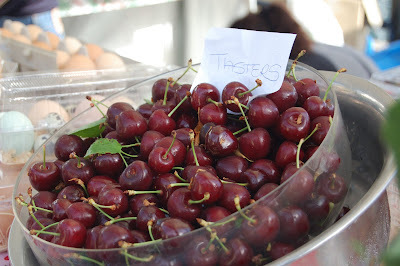 Cherries are something my family associates with Christmas particularly. December was the last Grower's Market for the year. Greeting me when I walked in was this delicious pile of cherries. How could I resist? And with a simply enormous box for only $10, I snapped some up before they sold out. 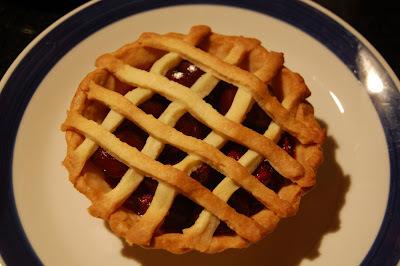 When I got them home, BF asked if I could make cherry pie. I have never made one before, so set about searching for a recipe. Sadly, almost every recipe I found called for canned cherries, so I decided to make it up myself! I have never made a lattice top pie, so you will notice that the two individual pies look rather different as I was experimenting! The pies were lovely, however, there was not much of a saucey consistency to the filling. Next time, I would prefer a more liquidy filling... do you have a recipe that you love? 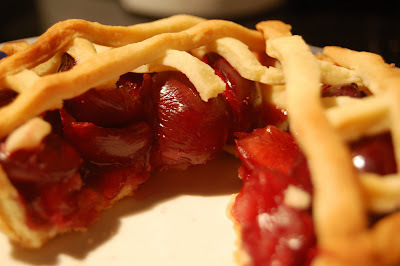 If anyone has a recipe they have used for a cherry pie with FRESH cherries (please no can fillings! ), can you please post a link in the comments? I would love to see it! I used this pastry base, and lined two individual pie tins with pastry. Pop the rest back in the fridge whilst you bake the bases. Whilst the dough is in the fridge, remove the pits from 1 cup of cherries, and mix in a bowl with 2 tsp castor sugar, a good shake of cinnamon, and a splash of lemon juice. Leave to marinate whilst you bake the tart shells. Just before filling the cases, mix a small pinch cornflour through the cherries. 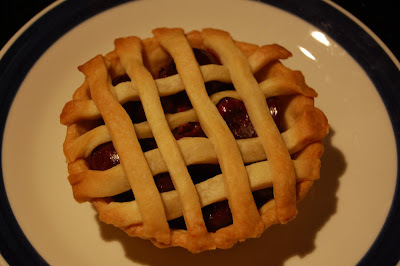 Fill the cases with cherry mix, then use strips of pastry to form a lattice, pushing the edges onto the base. 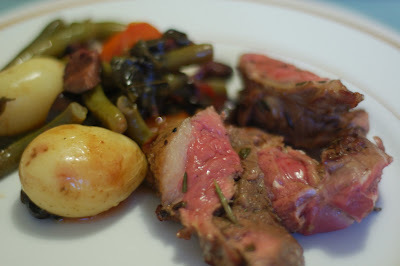 Cook in oven at 180C for about 20 minutes and enjoy! So so good! 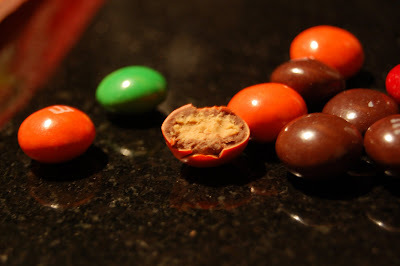 The usual candy shell, but in the centre of the chocolate was peanut butter! 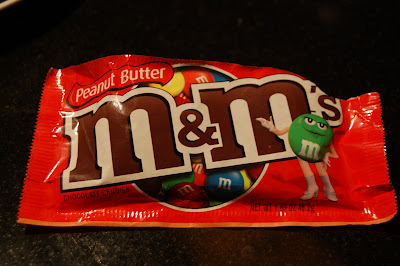 My new favourite M&Ms! By popular demand *well, friend FFichiban! * here are places in Sydney that sell these yummy morsels. 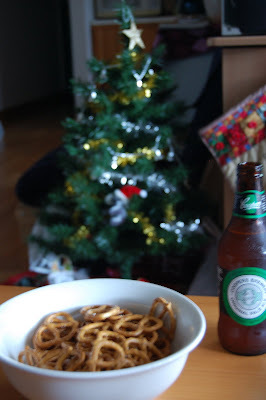 So after all the excitement of the Sydney Chicken Christmas Dinner, how does one continue celebrating? Easy! Head down to our hometown of Melbourne, for not one, not two, but THREE more Christmas dinners! Phew! 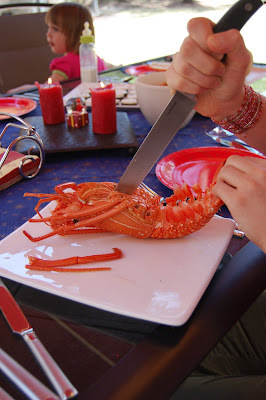 Me with no idea of how to cut a lobster! 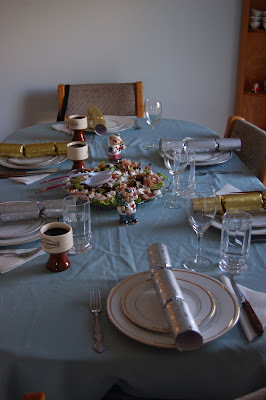 First up was Christmas Day lunch. It was a delicious cold spread, consisting of lobster, prawns with avocado cream, ham, pork, tomatoes topped with pesto and bocconcini, cucumber topped with crab, fresh crusty bread, Christmas cake, pudding, fresh berries, custard and cream. Wow - I am full again just thinking about it! We spent lunch time relaxing with BF's family (those that were still in the country!) and drinking a lot of wine! Then came Christmas Day dinner! We set off to my parents' house, where the three courses are always eaten at a relaxed pace, as they know we are all already stuffed from lunch! 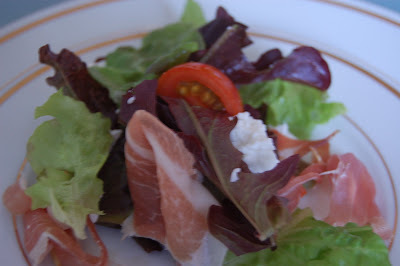 Entree was a simple, yet delicious salad of mixed leaves, pinenuts, cherry tomatoes, proscuitto and goats' fetta. The leaves and tomatoes were fresh from the garden that afternoon! 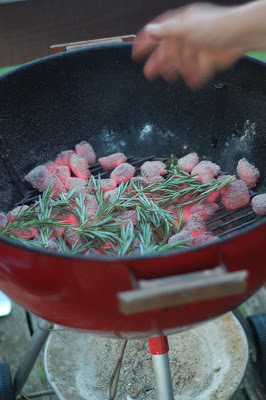 Main was roast lamb, marinated with garlic and rosemary, and cooked on the barbeque. Dad was in charge of mains, so his side was potato, green beans, cherry tomatoes, olives and anchovies, roasted in the oven - yum! We followed this with dessert of more pudding and custard! And Christmas night always ends still sitting at the dinner table 5 hours after we started eating, drinking wine and laughing the night away. 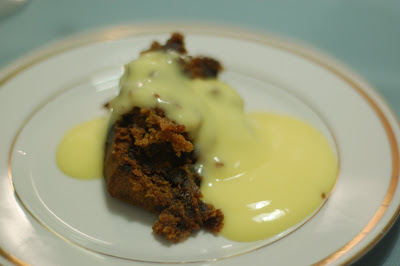 Pudding with custard - my favourite! 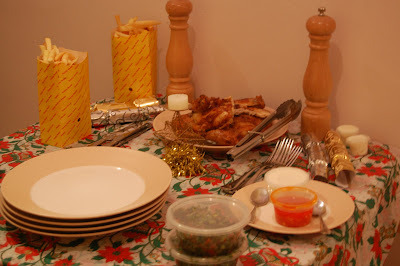 The third Christmas meal was with the extended family - and was a HUGE buffet of roast pork, ham, Lebanese sausages, marinated chicken, whole snapper with tahini, four different salads, roast potatoes, mango salsa, apple sauce... the list goes on and on. 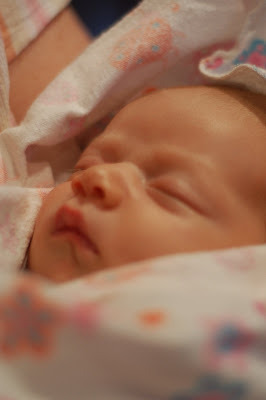 The best part of this day was meeting my new cousin Belle, born just a few weeks before Christmas! Our trip home was packed with fun, food, family and friends. Along with the above, there were BBQ's, yum cha, cricket... it goes on! I'm glad to see that all of you had a great time this Christmas, and hope that the new year brings you all health and happiness! Every year for the past 12 years, a friend of ours has thrown a Christmas party. It is a major event on our calendar, about 30 of us get together and spend the afternoon/night eating, drinking and being merry. When we moved to Sydney last year, we were the 3rd couple from our group living here. Work commitments meant that none of us would make it to Melbourne for the annual, and seeing it was the first Christmas in Sydney for both Sis and MJ, and BF and I, the 6 of us decided to start our own Sydney tradition. You would think that between Sis and I, we would work at whipping up a big fancy feast, but no. The other couple, SteveKat, were moving back to Melbourne just before Christmas, and MJ had been raving about this amazing chicken takeaway that he and Sis had found just near their house. Boys being boys, Steve decided that he MUST try said chicken before leaving Sydney. Thus, The Sydney Chicken Christmas Dinner was born. 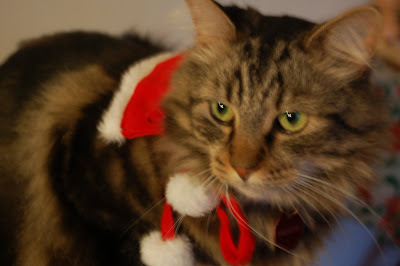 This year, there were just the four of us, and Sampson (Sis' cat!). After the craziness of December, it is nice to just relax with some good takeaway, a beer or two, a bottle of wine, and good company. 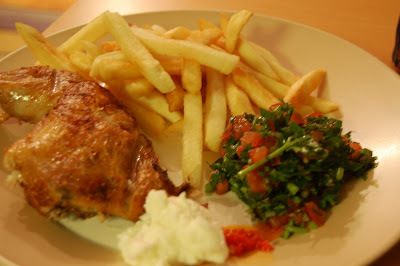 I know, you want to know about the food - barbeque chicken, hot chips, tabouli, toum and chilli sauce. MJ always makes sure to get extra toum and chilli sauce because we eat so much of it! Toum is a deliciously creamy garlic sauce made mostly from garlic and oil, is very pungent and addictive. A rather modest spread for Christmas, but a new tradition. It also means that by the time we all make it to Melbourne (I fly tonight!) that we have not overdone the Christmas foods early. I'm off to finish packing now - wishing you all a very Merry Christmas full of laughter, fun and food! The highlight of our dinner with Sis and MJ was supposed to be dessert. I know what you are thinking - after homemade pasta with rabbit sauce, it was the dessert that is the hightlight? But I was in the mood to impress. Dessert did impress. But not for the right reasons! It was supposed to be lemon souffle. Not the easiest dessert to make (and definitely the hardest to photograph - apologies for the dodgy shots! They sank sooo quickly!) I got the recipe from a Commercial Cookery text book, and forgot that the cooking times would have been for an industrial fan-forced combi-oven. Basically, I should have doubled the cooking time for my home oven! After we put them back in the oven - note spoonful missing! I did make the mixture correctly, and had I cooked them for the appropriate time (24 minutes) I think they would have been great. 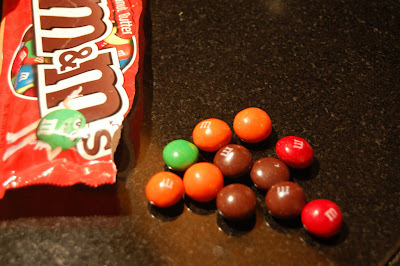 Unfortunately I didn't realise my mistake until we had eaten them! I first took them out after 13 minutes, served them, and after 1 spoonful realised they were undercooked. Sis and I put ours back in the oven, but BF and MJ were enjoying their lemon "mousse" so much that they declined the extra cooking time! 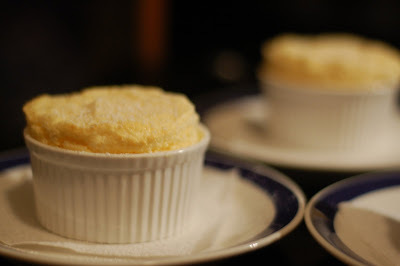 After 4 more minutes, Sis and I took ours back out - the edges where much more souffle-like, but the centres were still completely mousse-like. Ah well, we ate them anyway! 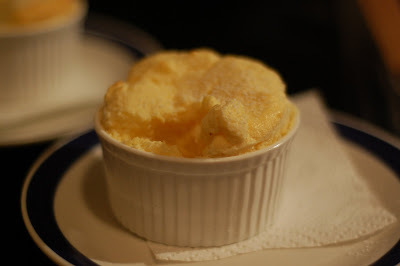 And for warm lemon mousse, they were rather nice! I'll put the recipe here in case you are game enough to try them - you will need to cook for about 24 minutes, but I totally suggest a trial run if you don't want the same thing happening to you! All ovens are slightly different and souffles are fussy, so it may take a few tries to get the exact times for your oven. Whisk egg yolks and sugar until almost white, then mix in the flour. Bring milk to scald point (just before it boils), whisk it onto the egg mixture, return to a clean pan, and stir over medium heat until it thickens (it will start to look like custard). Add a few drops of vanilla and taste to check that the raw flour flavour is gone - if not, keep stirring over heat until it is. Pour into a bowl and cover with cling film, ensuring the cling film is pressed against the pastry cream to prevent a skin forming. 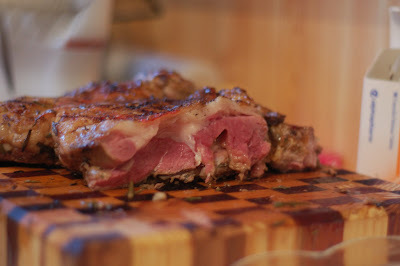 If you are making this for a dinner party, you can prepare up to this point ahead of time. Add the egg yolk, zest and lemon juice to your pastry cream. Grease 4 ramekins with butter, place in fridge for 5 minutes, then remove and grease again with butter. 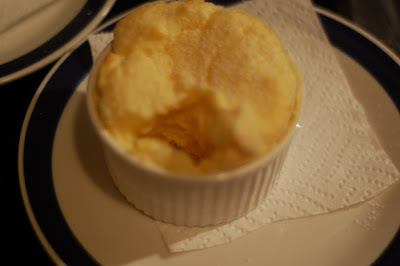 Ensure that you do not miss any spots of the mould (this will cause the souffle to rise unevenly). Sprinkle sugar into each mould and move the mould around to ensure every inch is covered with sugar (for the same reasons as above). Whisk the egg whites to firm peaks (add a little sugar partway through). Fold the whites into your pastry cream in 2 stages, first 1/4 of the whites, then the rest, as this helps to ensure maximum air retention. Place into greased moulds, smooth the tops and place in oven for approx 24 minutes. Cross fingers, toes, arms etc and if successful, impress the pants off your guests! Ooh, don't worry if the top of your souffle gets quite brown whilst cooking - it is more important the the centre is cooked. If the top is too dark for your liking, dust with generous amounts of icing sugar and ta da!